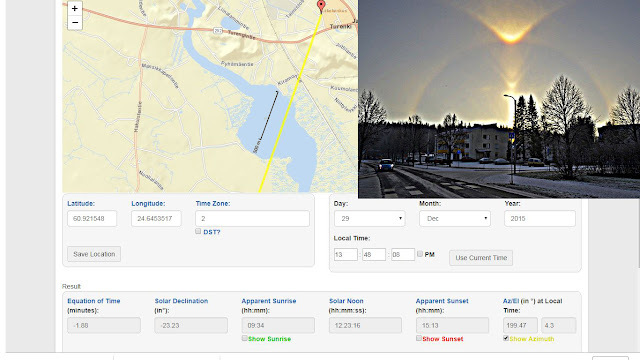 Järvsö display at 1137 local time. Photo Louisa Westberg. Two days before the mighty Borlänge display in Sweden, on 12 December 2018 another display worthy of recognition was seen about 150 km further up north in the small town of Järvsö. We know about it thanks to Louisa Westberg, who immortalized the sighting with commendable photographic coverage. 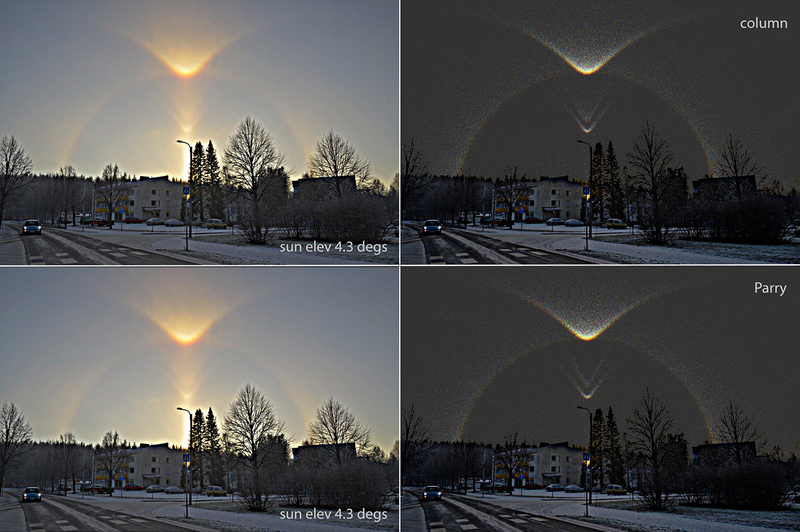 She had published one photo, the last one she took of the display, and it contains a feature that warrants a few lines here: the V shaped arc between the sun and 22 upper tangent arc. The halo looks like Moilanen arc, the location is just about right. But the shape doesn't quite match – the V is too sharp. 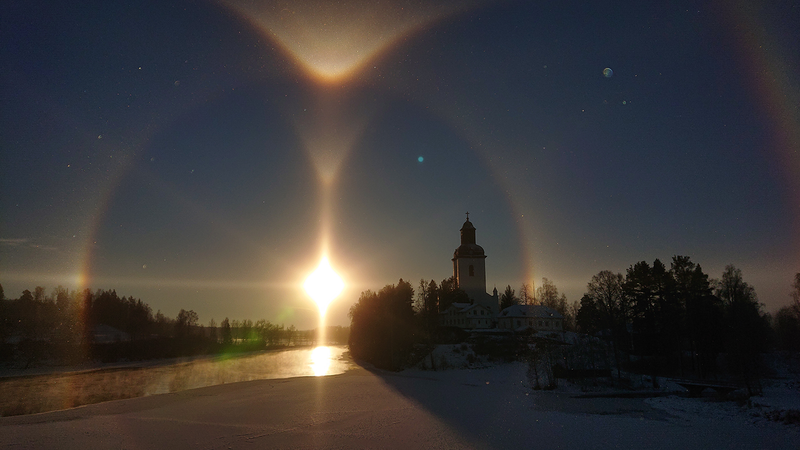 Rather, the halo looked to my eye more like the so called reflected Parry arc, of which only two sightings are known. A simulation using the highly flattened tabular crystals needed to make the reflected Parry seemed to give good match. I informed some friends about the display and what Walt Tape saw in the photo was not a reflected Parry, but rather a 22 tangent arc originating from sunlight reflecting from the water. For him there seemed to be enough water surface to make such halo and, moreover, the cusp of the V is filled also with light, which would be the case if the halo was a tangent arc, but not if it were a Parry arc. Different simulated scenarios for Järvsö display. M = Moilanen arc, RP = reflected Parry. Photo Louisa Westberg. Simulation software HaloPoint by Jukka Ruoskanen. Walt's argument sounds like a winner, but what if the light in cusp of the V comes from the strong sun pillar that extends all the way to the 22 upper tangent arc? Then the halo might still have the chance to be reflected Parry, which does not need reflecting external surface for its formation. The simulation I made doesn't test this scenario, though, as the pillar in it is quite non-existent. In the end, Louisa's other photos of the display seem to clinch the issue in favour of tangent arc explanation. 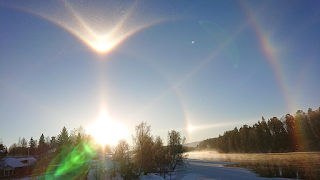 Photos where there is no water in the direction of the sun show no V. Two photos where sun's reflection is at the edge of the far shore have a rudimentary V shape in nearby crystals. This is what would be expected because reflection from far shore edge would provide light only to crystals that are very close to the observer. And finally, when Louisa moves near the other end of the bridge and takes in quick succession three photos from the same spot, there is a long stretch of open water from the sun image backwards. All this water surface would be effective in making the reflected light tangent arc, and true enough, the V in this last triplet of photos Louisa snapped is solid and bright. 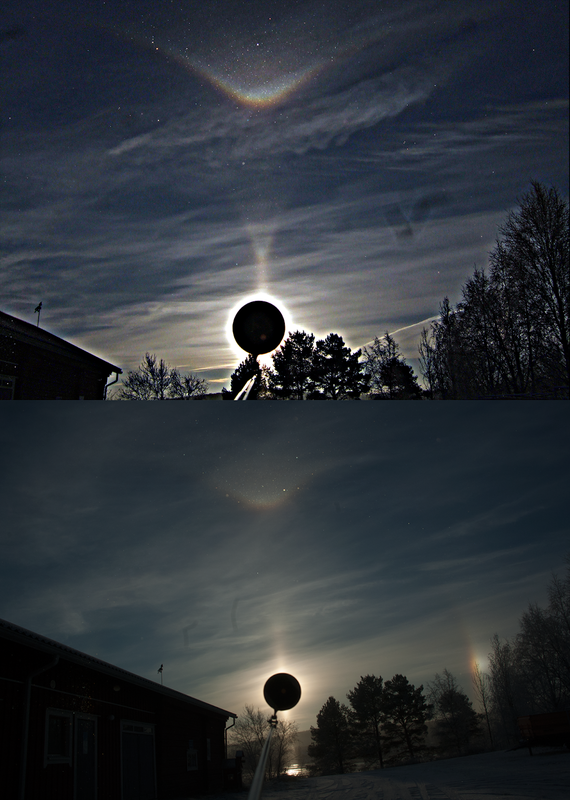 Four successive photos of Järvsö display taken before the main photo at the top. The times for photos are 1131, 1133, 1135 and 1136. A rudimentary V is visible in the last two photos. Photos Louisa Westberg. 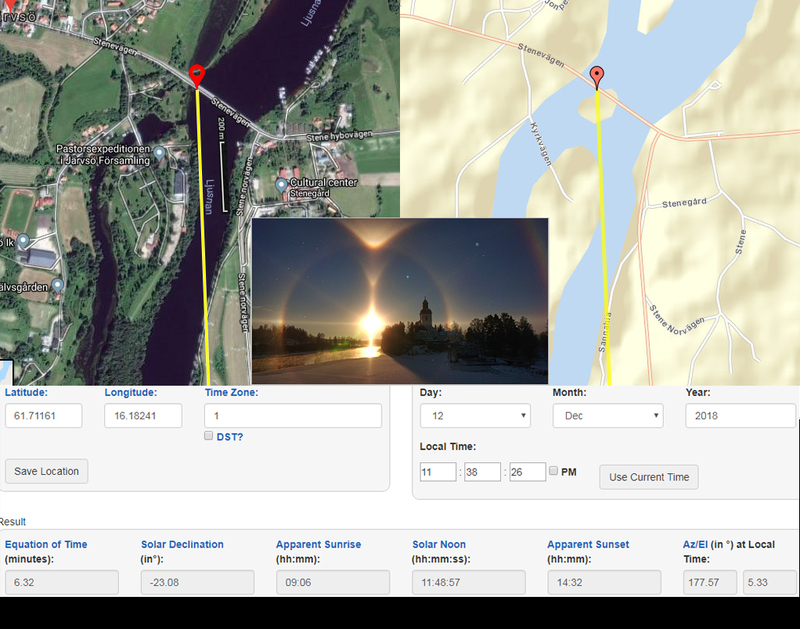 The location for the photo in the middle (at 1137) is marked by red pins in the map and satellite photo. Yellow line marks the direction of the sun. The location is according to the geographic coordinates in the photo exif data. Sun elevation was 5.3 degrees. A diagram by Walt Tape. Now our attention must naturally turn to the two older observations that have been interpreted as reflected Parry arcs. Could they, too, be tangent arcs from sun reflecting on water surface? 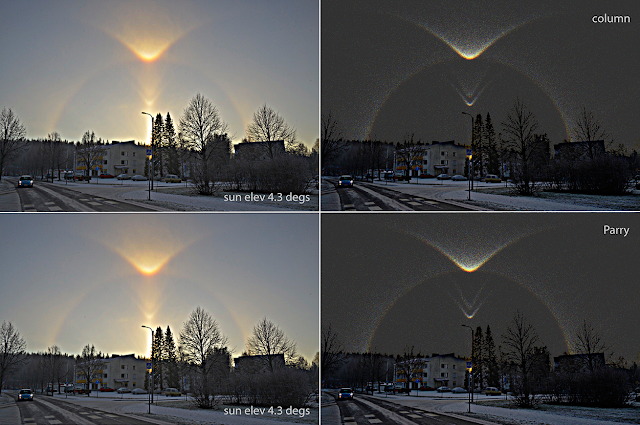 For the first display, that I photographed in Rovaniemi on 6 November 2008, the answer looks positive. 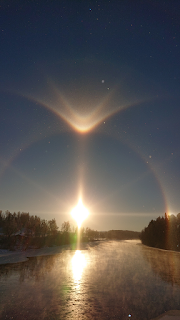 There was a river between me and the sun at the time of the occurrence of the arc, and a search through all the photos I had taken indeed came up with two that show the river was open. However, if light inside the V is also needed to justify the tangent arc, then here we seem to have surprisingly little of this light. Top: a photo from the best stage for the V in Rovaniemi display. Bottom: a photo showing sun light reflecting on water (the V is weaker here). 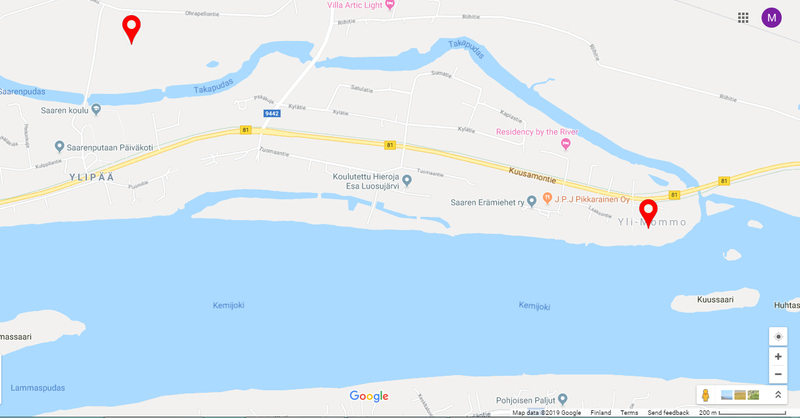 The V in Rovaniemi display was first observed in the location marked by the red pin on the left. The photos above are from the location marked by the pin on the right. 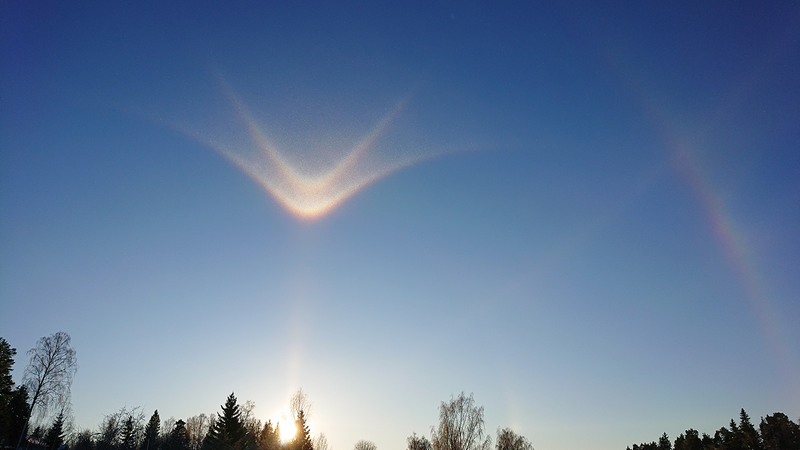 The second sighting was by Timo Martola in Turenki of southern Finland on 29 December 2015. The V is filled with light and there is a water body called Ahilammi – a lake like widening of a river – in the direction of the sun about 800 meters from where the photo was taken (the V shows up also in other photos taken in the same vicinity). But we do not have a photo of Ahilammi at the time of the observation. End of December is already deep winter and Ahilammi would probably be expected to be frozen. However, Finnish Meteorological Institute summary of that winter says December was "uncommonly and at places even exceptionally warm" in Southern Finland. Average temperatures in December in the adjacent sea areas were 4 to 5.5 C above the normal. Add to that the moving water in the river and it starts looking possible that Ahilammi was open and the V in this display could then be interpreted as tangent arc from sun reflection. Turenki display and two simulated scenarios. Photo Timo Martola. Simulation software HaloPoint by Jukka Ruoskanen. Location for the Turenki display photo and sun direction. Photo Timo Martola. 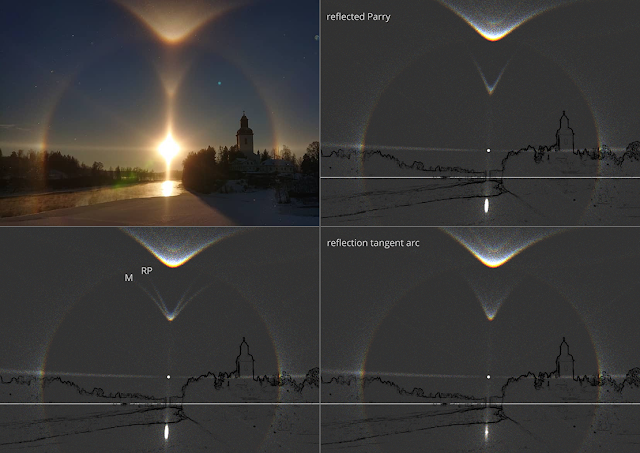 Finally, shape may also be used to distinguish between reflected Parry and tangent arc from sun reflection as the V of the former is slightly wider. The difference is small and not something one might rely too heavily on, but if it was nevertheless used as a criterion for the Järvsö display, it seems the tangent arc scenario might just come out more favourably. For the Rovaniemi and Turenki displays this comparison seems inconclusive. So where this all leaves us? Perhaps reflected Parry never actually existed and all these three displays instead have tangent arcs from sun reflecting on water. 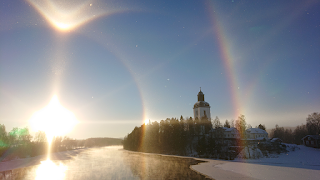 As usual, more observations would be nice and now that we know about the possible role of open water, informed attempts to see the halo can be made. Quite an unexpected twist if all this is correct (as it might well be)! Thanks for sharing this impressive analysis, Marko. Sweden is doing very well in the halo business nowadays. Impressive, indeed! About Ahilampi state in the time of Timo Martola's observation: maybe it was frozen just after the light snowfall (or just frost?) seen in the pictures? 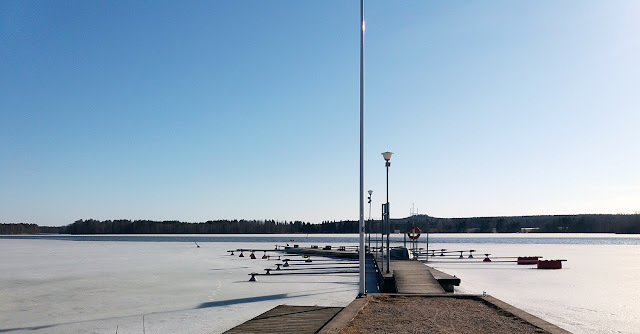 Clean ice cover would be even better reflector than rippling water (especially as a source of non-divergent reflection, like we have discussed in other case). Its amazing more new halos keeping being discovered. Good point Tero that reflection from ice would do as well. I think there was one such likely case of reflection subsun a few year back. I wonder if there is a reflected 46 supralateral arc?